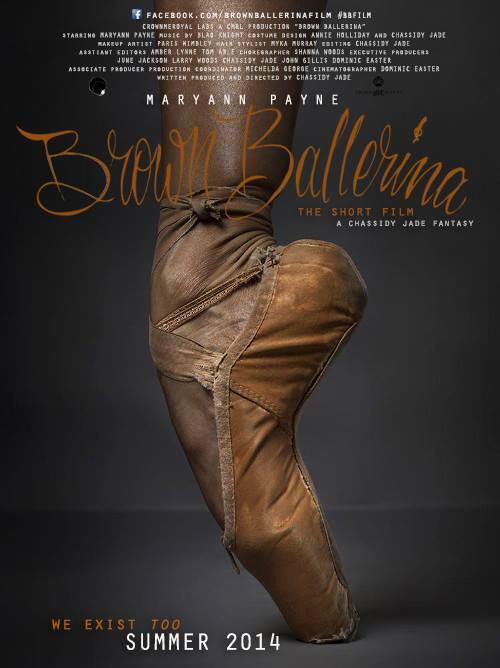 GLAM Life Blog: Tell us a little bit about yourself and your latest project, Brown Ballerina. Chassidy Jade: Brown Ballerina is a very artistic short film highlighting a young dancer’s story through an original audition dance solo. Professionally, I’m a video editor here in Miami and LA. I do a lot promo work for TV and Film, which I don’t think reflects my views or the diversity of us as a people. At this point I’m exploring the independent film world, trying to tell a different story. GLB: Where did your inspiration for the film come from? CJ: My sister was a Brown Ballerina, so the whole vision really came from her experiences. GLB: Like so many little girls, we took dance classes growing up and Jessica even kept on with it in college. What we noticed, however, was the lack of brown faces the higher up we went in dance. With that said, how important do you think it is for a wide array of body images and skin colors to be included in the dance world? CJ: I think it’s very important that dancers be judged off of their technique and their ability to uphold the ballet art form, not from images of a body type they can’t control. Forcing any woman to be ashamed of herself is ludicrous and only serves the purpose of unproductivity. With that being said, young girls, especially brown girls, deserve to see themselves in every light. GLB: Are you a dancer? If so, is this film based on your personal experiences in any way? CJ: I’m not a dancer, but I do think Brown Ballerina is a universal film. We’ve all been discriminated against and the film highlights a few things I went through. For instance, I did not fit in with the “black stereotype” but trying to find that confidence in yourself makes many pieces of the film relatable to all. GLB: So we’ve just got to know. When did you first start making movies? CJ: Haha! Well I’ve been making movies in my head for a long time. I have notebooks full of scripts but I did my first short film, Jezebelle, in college. I actually started producing my films when I was in school since I had the resources to do so, but I’ve been writing forever. GLB: Here at GLAM Life we definitely understand the need for representation in all forms of media (movies, TV shows, etc.). What’s one tip you have for someone who wants to create meaningful films for diverse audiences? CJ: You have to be true to yourself and true to your audience. Personally, I can’t write what I don’t know about or something I’m not inspired by. Everything I do comes from a personal place. I think the key is to be relatable, but at the end of day you have to find that fine line between what people want and sticking to your vision and purpose. GLB: We definitely want all of our readers to Go Live a Marvelous Life and make it their mantra of sorts. What’s your personal mantra? CJ: I live by this quote I created: “We’re taught to relate, not to think for ourselves so that it’s easy to find comfort in boxes that fit a specific character. Once you step outside that character, you become human.” This quote means I try to be who I am. I don’t let where I’m from, my race, age, who I know, or anyone affect who I am and who I will be. GLB: Who are some of your favorite filmmakers? CJ: I have a couple: I love Stanley Kubrick and Quentin Tarantino; they really pushed the envelope. I’m definitely a Spike Lee fan, I like his cinematic style and messages. Tony Scott has inspired my editing style, while F. Gary Gray is so versatile. Hype Williams is my all-time favorite director, though. He actually does music videos, but they’re like films to me and have inspired me so much. GLB: When you’re not off directing and being extraordinary, what do you like to do for fun? CJ: I’m a big kid. I love go-karting, swimming, bowling and being active. I’m a super chill person, so I love going to poetry spots, art galleries, and events with live music. I’m also very into fashion and the culinary arts. I love to cook more than anything. GLB: All in all, what’s next for Chassidy Jade? CJ: Besides being just a movie, Brown Ballerina is a movement. We have started a non-profit organization for young girls to experience ballet by having dance programs, giving away scholarships, and hosting local screenings. I have a line of upcoming projects, though. My next project is a play on my post grad experience and what I felt like I didn’t learn in college. It’s a serious comedy, so I’m very excited about it! Definitely check out more of Chassidy Jade’s Brown Ballerina on its official movie website and Facebook page! Also, follow her @crownmeroyalxo on Twitter, Instagram, and YouTube; you’ll be glad you did!